The D_T-1W series are specially designed for applications where a group of polar power supplies are isolated from the input power supply in a distributed power supply system on a circuit board. 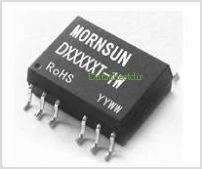 These products apply to: By MORNSUN Science& Technology Ltd. This is one package pinout of D050505T-1W,If you need more pinouts please download D050505T-1W's pdf datasheet. D050505T-1W circuits will be updated soon..., now you can download the pdf datasheet to check the circuits!